Led by a talented team of professional artists and art students from local colleges and universities, attendees of the 2014 Taste the Arts Festival, to be held on Saturday, October 11th in downtown Visalia, will be able to take a crash course in a variety of tradtional and non-traditional art techniques including block-printing, screen-printing, spray painting, stencil-painting and more. Participants in the activities will be able to create their own artworks or add to a series of large-scale collaborative works, all under the guidance of professional artists. 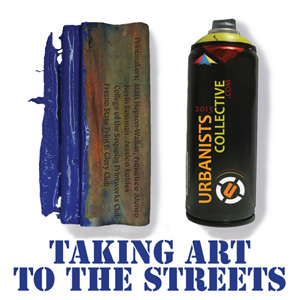 The exhibition will feature works of urban art, block printing and screen printing by the artists of the Urbanist Collective, as well as faculty and students of the College of the Sequoias and the Fresno State University printmaking programs. Artists featured in the exhibition and leading the public during the festival activities include Erik Gonzalez and the artists of the Urbanist Collective, Orlycukui, Shortyfatz, DJ Agana, Reydiem, Matthew Hopson-Walker, Francisco Alonzo, Jessica Robles, as well as members of the COS Printworks Club and the Fresno State Print and Glory Club. Taking Art to the Streets, the exhibition, will be on display at Arts Visalia October 3rd through October 31st with an opening reception on Friday, October 3rd from 6 to 8pm. All workshops and public art activities will take place as part of the Taste the Arts Festival on Saturday, October 11th from 11am to 6pm at the site of the former Keith Brown Lumber Company property on the corner of Garden and Oak Avenues in downtown Visalia. Admission to all events is free and open to the public. Visit www.artsconsortium.org for more information on the Taste the Arts Festival.